This vibrant green and gold reminded me of life. So, I have named it Vitality. This was difficult to make, as adding the gold was time consuming and just difficult. My creative friend, Rachel, has invented nursing covers that are fast becoming all the rage! Not only is she selling on Etsy, but she is also going to be at the Sarnia Etsy-in-person event! I am so excited for her as she launches this, and I am sure that all my readers who nurse their babies will find these the best purchase they have made to date! So, head over to her facebook page and Etsy store and choose your favorite color and enjoy all the functionality and comfort! There really is no other description for this parasol, I am so thrilled with its whispering little ferns. I simply love the purple. but has published her own book! - the downloadable version is perfect for kindles! Annie Clark from Pittsburgh, Pennsylvania, was born without hands. She won a National Handwriting Contest in 2012. She has appeared on the Glenn Beck show twice. She continues to inspire the world with her determination and persevering spirit. Visit her website here http://www.writewhereiam.com. I tried my hand again at painting with fairly good results. 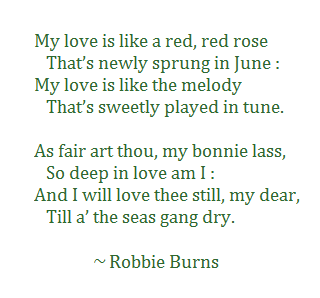 This parasol reminded me of this poem by Robbie Burns, "My love is like a red, red rose." These are my favorite verses of the poem. 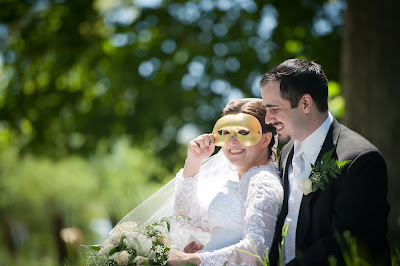 And now for our featured guest, the very talented photographer who took our wedding photos! Vince is a talented photographer and artist. I truly admire his work and attention to detail. He also has an eye for the artistic candid photo. You can visit Vince's website to see more photos and artwork. We couldn't be happier with our pictures! This parasol is another wonderful, classic piece renaissance style artwork. Does it not looks like stain glass? Abbie designed and painted this one. I decided to try a new look and added ribbon edging instead of the typical lace. The outcome was better than I even imagined with the blue and gold accenting perfectly. Well, that is all I can add for now, but check out our featured guest! I love the pampering happening here! Isn't this shop great? From the lip balm and salve to the custom water bottle, it all says spoil me! Check out this awesome Etsy store for more cool items. Day 17 of the 40 Day Challenge: Russian Inspired Artwork and a Amazing Pottery! Inspired by designs from Russian Folklore Story that I had in childhood, this parasol is my next painting project. I also decided to cover the top steeple in lace as I wanted the same green lace on the top as on the edges. I love how dark the foliage is becoming, I can feel autumn coming ~ just around the corner. And now for our featured guest - check out this amazing pottery! Just look at these incredible masterpieces! Sarah's hand crafted pottery is incredible. fun planters are my favorite! Visit Dudgeon Pottery at the facebook page here. For all the children & tot photographers out there, check out this creative shop on Etsy! Can you get over how cute these are? I can just imagine a cutie wearing the little punkin hats holding a sign "Mommy's Little Pumpkin" . Fall is just around the corner, so visit this shop by clicking the pictures or at her facebook link here https://www.facebook.com/lilChicMe. Well, this parasol turned out electrifying! I simply love how the high Victorian Stencil turned out! Now, speaking of blue, scroll down for our featured guest, The Blue Daisy Shoppe! Mel is a creative and talented crafter! These are just a small sample of the items that she makes and sells. I just love these knitted hats! So warm and inviting! Perfect for the cold winter that is upon us! And ladies, she makes scrubbies! Handmade scrubbies are the best! They last so much longer! Stop by her facebook page and like her page! This post is late today, it is almost 10 p.m., everyday life can cause great interruptions! I love how the tree is a symbol of life, and how life really goes well with our featured guests, who are beginning the long journey to adopt. Before I even introduce you to the new design, I want to mention our guest today. I just can't let you forget to scroll down to the end! Our featured guest is a little boy named Jadon, who has been adopted into the most wonderful family. I asked Jadon's mom if I could feature his journey on my blog, I hope you all follow their site as I do! Jadon has multiple heath complications and has undergone many surgeries, it's a continue process and a long road to recovery! So, I have named this parasol in honor of Jadon, the Fighter's Hope. And in Jadon's case, he isn't fighting a battle with a sword, but a battle for life! Please scroll down for pictures of our sweet cutie and the link to his family's blog! And now to introduce Mr. Jadon. This is Jadon during therapy. He's such a happy boy. It's not over yet, Jadon is still facing at least 1 more surgery! I hope you will all take the time to pray for Jadon and his family at this time! So, we are very excited today, because within two weeks, I hope to have actual floor space! Yes, Ash Tree Meadow Designs is planning to set up shop downtown St. Mary's in the new Emporium that has come to town! As you can imagine, this means the hustle and bustle has increased and I am asking myself how I thought I would have time to post each day? SO GLAD for the featured posts! As I have promised a day to each of my honored guests, and so WILL be posting! It's great motivation! Well, this design is a specialty - I call it Medieval Cathedral - it is almost gothic in design. The black lace will be appearing often, we found a super deal on it! But I just love what Abbie has done with latest design! She drew her inspiration from the lace I had chosen. I love how this one turned out, and it goes very nicely with our featured guest's book purses! 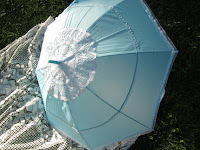 You can purchase this parasol here in my Etsy shop, and remember - I make custom parasols! So, any steampunk, gothic, victorian, historical, theatrical design you need ~ let me know! Aren't these clever? I love the old covers! This is such an awesome idea, you can wear your favorite book! My problem is deciding which is my favorite book - right?! These also make excellent gifts! Visit Karen and her shop via this link or click the picture https://www.etsy.com/shop/novelcreations.